Fit perfectly. This style doesn’t have strings to pull the blinds up and down. You pull the end of the blinds to release the blinds down or to push them up. I like this way better because sometimes the styles with the strings can get annoying when you don’t pull it at the right angle. 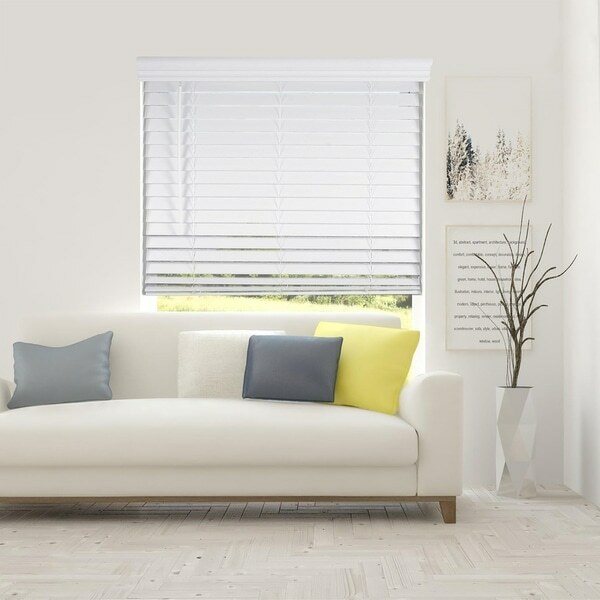 Privacy while allowing light to gently filter into a room are features that you can control with this white, cordless, 2-inch smooth finish slats faux wood that comes with a royal valance. This beautiful faux wood features a 36 inch, 48 inch, 60 inch, 73 inch, and 84 inch drop (height) options with various widths ranging from 17 inch to 72 inch. Faux wood is not only easier to clean, but a classic look that is now even easier without all the cords involved! No more worries about children or pets tugging at the window because of all the cords. This product is intended for indoor use only. This shade provides a light blocking feature thus creating an overall room darkening environment. Type: Cordless Lift, Faux Wood Blind, Vinyl Blinds, Privacy/Room Darkening Shade. Product Features: Energy efficient, light blocking design, wand to tilt slats, inside or outside window mounting capability. 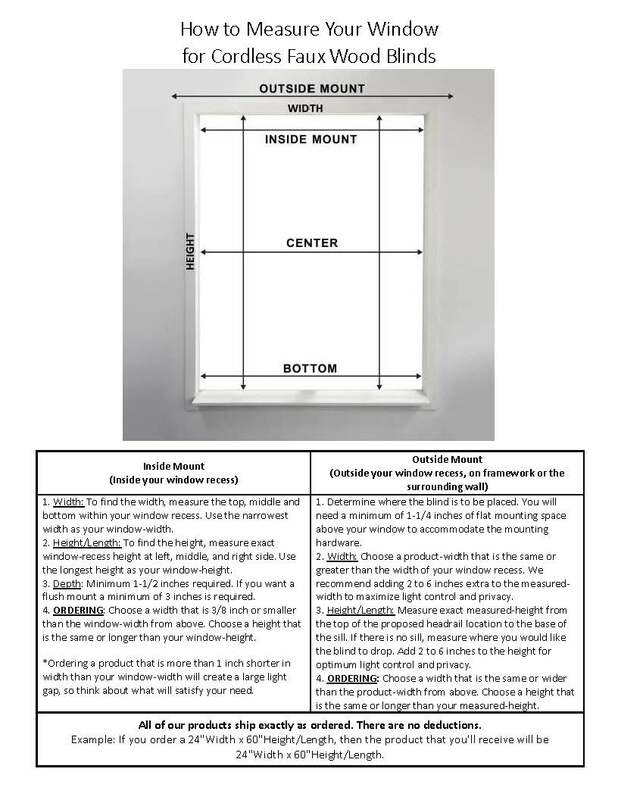 We recommend you to refer to the How to Measure Your Window guide in order to select the appropriate size for your window. For an inside mount, please choose a width that is 3/8 inch or smaller than the window-width from what you measure. Care instructions: To clean the slats on the blind, use a soft cloth, feather duster, dusting mitt, or vacuum lightly using the soft brush attachment. Please avoid using solvents or abrasive solutions to clean the blinds since this may damage the blind. Dimensions 20.0 In. X 73.0 In. Very nice and looks great! The directions are terrible when it comes to the valance installation. It should clearly state that inside mount don’t use the full royal valance. Ask for help? Good luck with someone to tell you that. Still very happy with my purchase. PROS: Blind adds a lot of value to a window Light looks beautiful coming through the 2" blinds Cordless, so it keeps my cat from messing with the string The stick snaps in like a dream and works smoothly CONS: Set-up: The hardware is finicky and the royal valance isn't worth putting on. We ended up throwing all of the royal valances away because we prefer the minimal look of the straight line without it. Other than that, the set-up is quick. The blinds are nice. My only issue is that the valance doesn't work if you are inside mounting them. It only works if you are outside mounting, as the sides are way too deep. We are going to cut them and see if they will work. Also, the bottom slat does not lay flat enough and lets light in. All around they are nice though, especially for the price. The color is a true white. I bought 4 white cordless blinds for my sun room over looking the lake. Instillation was a breeze. Royal valance is a nice finishing touch. Cordless blinds look so much better, no cords to adjust or look at. The blind adjusting rod works smoothly no binding or catching. Closure is complete between the blinds. I am going to change our faux wood to these. I love them. Just push them up to raise the blond and pull down to lower it. So much better than the cords! Excellent quality. Easy to install. The Royal Valance looks is the finishing touch. Fast delivery, before scheduled date. It looks like real wood. Very pleased and recommend it to anyone who wants to buy high quality blinds at a reasonable price. Perfect for budget window treatments. Instructions were awful, but with a little common sense, you can get them up and operating in 15 minutes per window. For the valance, I used Velcro instead. Saved myself a lot of aggravation by not using the clips, and I could eliminate any gap between the window frame and blinds. My brother-in-law hung these this past weekend and I can't believe how beautiful they are! They lift up and pull down so effortlessly, such an improvement over corded blinds. I have recommended them already to several friends and neighbors. I definitely plan to buy these for some other windows. Beautiful and as shown. My only complaint is that they are hard to lift and pull down. This might get easier with use though. Good price and value. Love these! Just as described. One of 3 that I ordered were cut just a few centimeters too big, but customer service was great and sent me a return label right away. easy to install and lift up and down, does darken the dining room once closed. I love the ease of pulling up and pulling down and love the no cordless! It was fairly simple to install since this was the perfect size needed for the big picture windows in our house. the price is unbelievable compared to other vendors. These are exactly as advertised. They fit perfectly - I like that they go up and down by pressure vs by a string and they really do look like expensive wood ones. "I see that some reviewers indicate that if you mount these inside you can’t use the royal valance. Is that true? And us yes what will cover the top frame of the blinds?" You can mount these shades as an inside mount and attach your royal valance. You will want to ensure you are not mounting your shade too deep in the window recess. The clips will not attach if the blind is too far back in the window. "Is there a way to shorten these blinds, or do they have to be the exact height?" "It looks like the top "valance" extends past the actual blinds. How much wider is the top than the blinds themselves?" The valance is attached to the front of the head rail which will extend approximately 2.5 inches from the back of the head rail where the shade is attached. "what is the depth and thickness of the royal valance?" These are 2 inches slats. I hope it helps. "For inside mount do these blinds mount from the top? 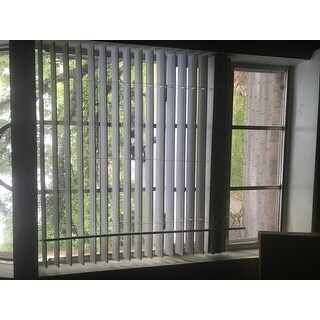 How much of a gap will exist if I use 2 blinds side by side?And I didn't see width of the slats. How wide are they? And is the color white white and not off white? Thx"
These blinds come with Universal mounting brackets, They can be mounted inside outside, or top mounted. Since no deduction will be taken from these blinds you can determine how far about you will need to mount them. The brackets are approximately 0.25 inches on each side. These are 2 inches slats. The color is white, however it is not a bright white. 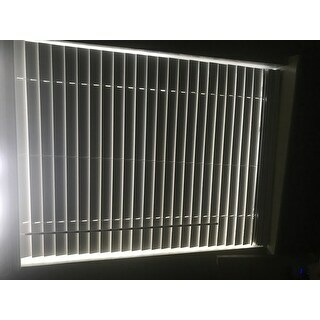 "How do you open the blinds while they are in the lowered position"
If you would like to tilt open these blinds you can use the tilt wand. If you would like to raise your blinds you would gently push them up using the bottom rail.